A Happy Horsey Year | Paint later, a painter's blog. I remember drawing a clagged out old horse in a paddock in art school. It’s days were numbered and the teacher thought it was a good choice as it didn’t move too much. I don’t think having the horse stuffed and mounted would have produced any better results. I do remember the smell though, there’s nothing quite like a horsey smell and they are such beautiful animals. Walking my dog at the lake last week, a herd possy group of bikini-clad girls riding bare-back threw themselves through the water and rolled in the sand. The markings on one horse were the most stunning I had seen -almost a painting – tans, with a zinc white shape edged in a warm grey. 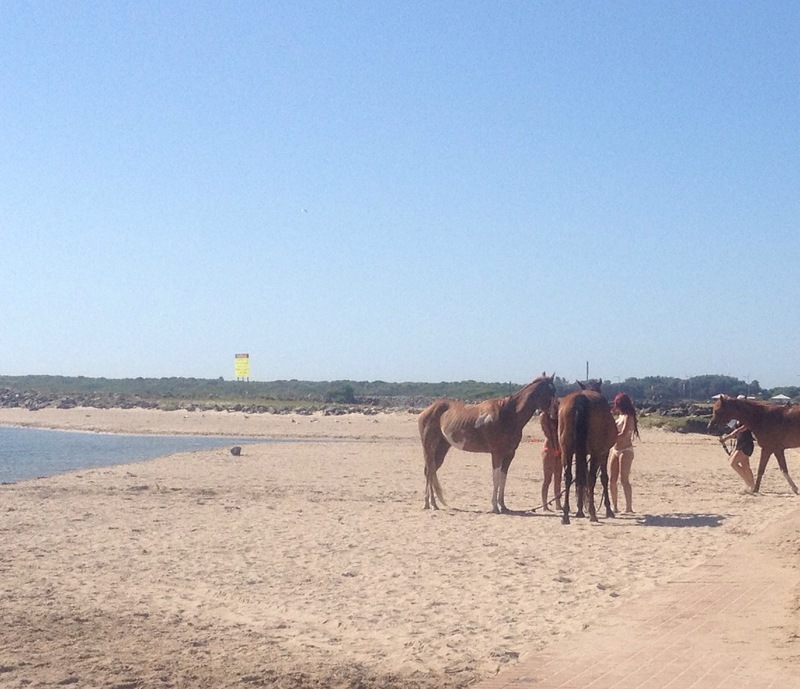 They were the epitome of freedom -riding free down the beach, wind in their hair and horses galloping. Yesterday I realised it was year of the horse. 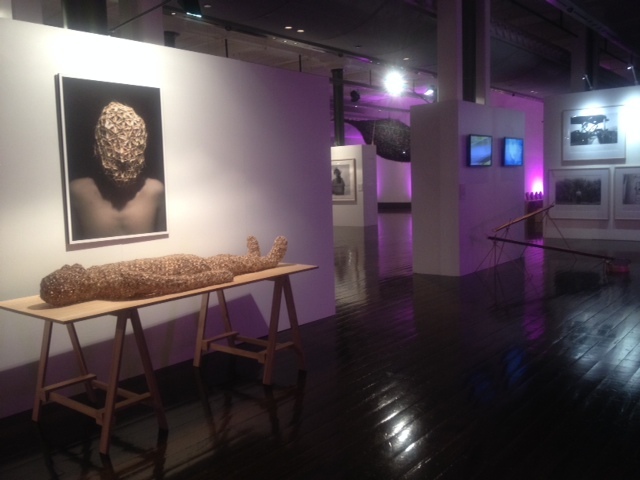 I went to a great exhibition Crossing Boundaries -A Celebration of Contemporary Asian Australian Art. Housed in the lower part of the Sydney Town Hall it was a tucked away gem. 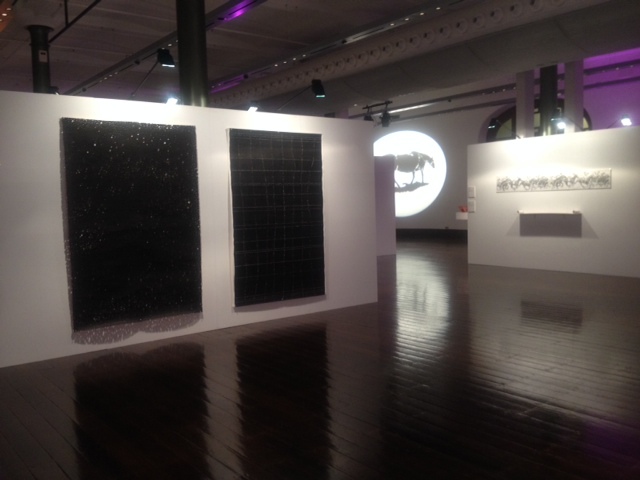 This beautifully curated show included polished work by prominent Asian-Australian artists such as Guan Wei and William Yang but it was a wonderful mix of emerging young artists. 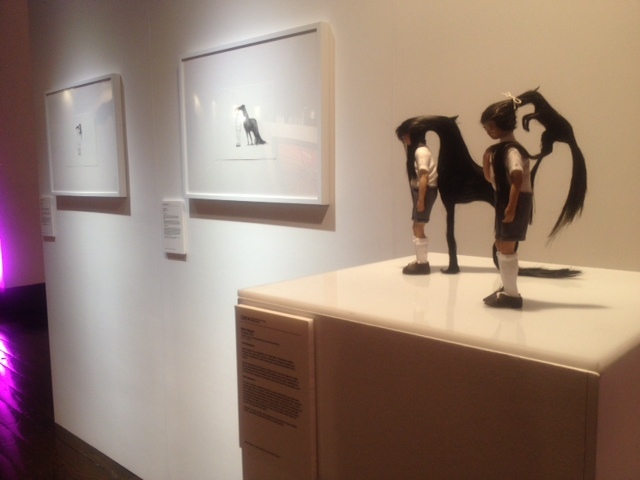 One of my favourites was by Mylyn Nguyen beautiful piece Ponytail that so simply relates the merging of cultures. She talks about the relevance of the horse in finding love, to her everyday appearance and significance of parting her hair in the middle making “my monkey and pig hate each other”. Horses featured heavily throughout the exhibition signalling an indication of strength and energy in the new year, perhaps the horses on the beach were a sign 2014 would be one of increased strength and maybe my new gym membership will see me becoming stronger, faster and rolling in the sand. Mylyn Nguyen Ponytail Drawings and sculptural pieces. Love your description of the horses by the lake and the markings on the horse. Happy Australia Day! No worries- I was up all night with those bulbs! Happy Australia Day, Sue. Very vivid picture you paint there. By the way, what’s your surname? Or is it a secret? Thanks David. No secret, just mysterious, it’s Dale. Cheers Sue. Love Mylyn Nguyen’s work – such detail! Such patience! It was a great exhibition and her artists statement was quite lengthy but so beautiful and added an even further dimension to her skill.